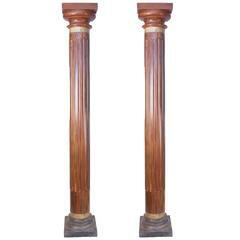 Beautiful pair of authentic teak wood columns from India, circa 1900. Colorful, yet subdued, the pillars have their original paint, a medley of blue and green, with hints of deep red. 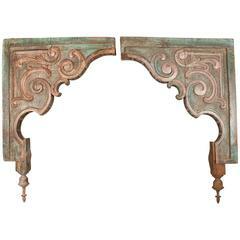 The Corinthian capitals are hand-carved with a floral design, and the sandstone bases have retained remnants of color. These Gujarati architectural treasures are in excellent condition for their age. Small chip on the corner of one of the stone bases (see image #11)&mdash;neither unexpected in architectural elements of this age, nor a distraction from their beauty. Faint traces of white spiral on one of the columns (see image #6).